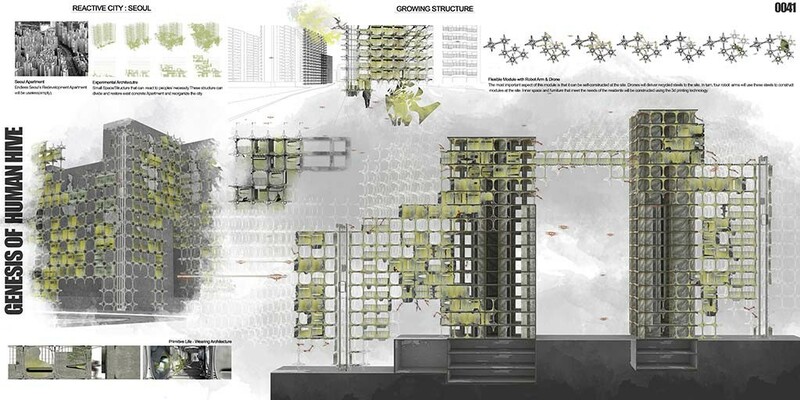 ‘Genesis of Human Hive’ is an experimental project to revive soon-to-be futile apartments in Seoul. This project seeks ideas on how to adapt the apartments in Seoul for future lifestyles of Seoul citizens. This project also aims to fully utilize advanced technologies to renovate the apartments in Seoul. The author suggests a ‘growing’ structure that can flexibly respond to changes in lifestyles of its residents. Structural module suggested in this project can be constructed without using bracing because this module can distribute load power. Moreover this module has a directivity, in a sense that it can mutate its physical form according to changes in urban environments (e.g. road conditions). These newly-suggested buildings will function as clothes, which help people to adapt to their environments in the best way. Like primitive humans who used to find and build space that helped them to survive in the cruel nature, these buildings will help citizens of Seoul to have flexible lifestyles in future.